Imago Dei Community values children as uniquely gifted individuals and vital members of Christ’s body. Our vision is to see them integrated into the life and work of the church. This begins with stepping alongside parents to nurture each child’s relationship with Christ. In the classroom, it means exploring God’s daily presence in our lives through creative arts, adventures in nature, lively discussion, and guest speakers. As a whole, every activity and lesson is designed to foster a deeper understanding of a few simple points: that church is about a community formed and led by the God we see in Jesus Christ, that every child brings something unique and beautiful to God’s community, and that at Imago Dei there is always freedom for anyone—young or old—to dream big about how God would love the world through His people. We are committed to helping our kids grow in the grace and knowledge of Christ in an environment that is fun, safe, and creative. Through worship, the narratives of scripture, and connection with adult leaders, kids have the opportunity to learn and experience what it means to live as a valued part of God’s kingdom. Classes are provided each Sunday for Infants/Explorers aged 0-2, Toddlers/Adventurers aged 3-3.5, Preschool/Seekers 3.5-5, Elementary/Pathfinders K-3rd grade, and Older Elementary/Navigators 3rd-6th grade in classrooms just outside the cafeteria/sanctuary. To learn more, contact Ashley Brassea at ashleyb@idcpdx.com. Infants (Ages 0 – 2): There will be no more than a 1:4 ratio. Toddlers (Ages 2 – 3.5): There will be no more than a 1:7 ratio. Preschool (Ages 3.5 – 5): There will be no more than a 1:10 ratio. Elementary (Kindergarten – 3rd grade): There will be no more than a 1:15 ratio. Navigators (4th – 6th grade): There will be no more than a 1:15 ratio. Imago Dei Nursery (ages 0-1) gathers on the lowest level of the Imago Dei sanctuary each Sunday. Please arrive 15 minutes early for check-in. See map. This room is reserved for our smallest babies. We have lots of toys, balls, books and swings to keep your little ones stimulated. We have a quiet corner with a port-a-crib so your child can rest when needed. Our volunteers love playing with babies and are prepared to help with any separation anxiety. They will make sure that they get any special instructions from you regarding feeding, changing, and sleeping habits before you drop off your child. The infants room is attached to the mother’s room, so if you’d like to have your baby held after feeding, you can trust our volunteers right next door! We really want you and your child to feel comfortable and at ease. One year-olds are introduced to structure through playtime, clean-up, story time and snack while experiencing consistent adult and peer relationships weekly. The goal of this room is to offer lots of space since these little ones on the move and ready to touch anything! This room has lots of toys, books and room to play. We also offer some simple curriculum each week that teach basic words and phrase about God’s character. Our team enjoys getting to know your little one. They’ll likely tell you at pick-up time what your child liked best, who they made friends with, and what stands out about their personality! The more consistently your child is involved in the nursery, the more comfortable he/she will feel. It is common for babies to cry immediately after parents leave, but they usually calm down. We will not let your baby cry longer than 5-10 minutes without informing you. You will be given a pager when you check-in. You can inform the nursery caregiver of any special instructions, such as allergies, feeding schedules, nap times, and whether or not you’d like us to change your child’s diaper, on the clipboard at the entrance of your room. Please fill this out each week so we can provide the best care possible for your child. Please also label your child’s belongings. For your child’s safety, we only release him or her to the authorized parent that returns with the child’s identification sticker. We cannot admit any sick child into the nursery. If your child has had a fever or contagious illness within the last 24 hours, please keep them with you. Volunteers wash toys after each service and stick any soft items to be laundered in our laundry room. They are trained to wash their hands after diaper-changing and touching any body fluids. Care is taken to look for our babies’ developmental needs of babies (ability to sit up, how competent they are at standing and pulling up, etc.). 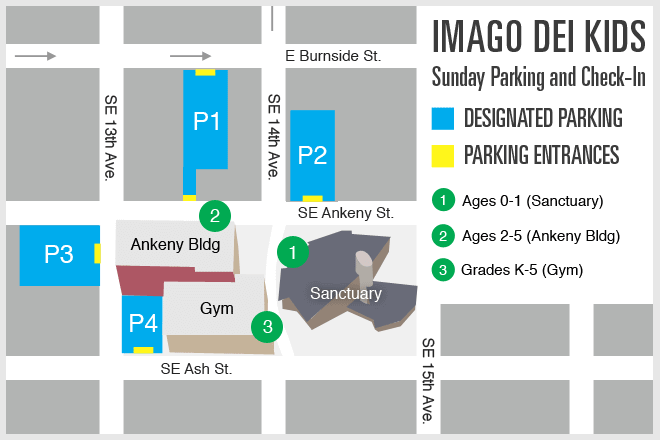 Imago Dei Preschool (ages 2-5) gathers in the Ankeny building (entrance on SE Ankeny, in between 13th & 14th Ave.) each Sunday. Please arrive 15 minutes early for check-in. See map. In this class, children begin to experience a faith community as they make friendships and get to know leaders. The curriculum for our 2 year-olds presents great truths about God in very simple words and shows glimpses of who God is through key Bible stories and tangible experiences. They will learn to pray and understand more about who God is through interactive activities, art projects, and songs. We also provide handouts each week that share what was done in class and how to engage the lesson at home. This is where children learn foundational things about God, the Bible and how to treat people. This room is where kids learn all about God’s story! The preschool class is set up with 5-7 learning/activity stations, a playground and self serve (supervised) snack area. We write our own curriculum and are currently working out way through the Bible using scripture, stories, and activities. Parent handouts with follow up conversation ideas are provided each week. Imago Dei Elementary (K-5th grades) gathers in the Imago Dei gym each Sunday. Please arrive 15 minutes early for check-in. See map. We strive to take kids on a journey to a deeper understanding of who Christ is, how they relate to Him, and how He works in relationship. The themes of each week’s gathering explore what living for Christ looks like and how ultimately, His reign is both here on earth and in the Kingdom to come. All kids stay together for first half of class for activities, worship, and a solid teaching time. Kids then break up into smaller, age-specific groups. Teachers read Scripture with the kids, ask and answer questions, and share their own stories of faith. Group time also often includes a response project involving art, writing, prayer, conversation, or serving. We provide a weekly take-home sheet that offers relevant scripture passages, practical opportunities to engage with the week’s theme, and different ideas on how to discuss the topic with your children. Teachers generally serve on a weekly basis to ensure kids consistently interact with a familiar face and thus feel safe asking questions and engaging in class. Parents are encouraged to talk with teachers before or after class about how their child is responding to the content socially, emotionally, and spiritually. All themes are taught in the context of experience so that kids can connect with it in a tangible way. During worship and experience time, we often have someone from the Imago Dei community come and share their talent, passion, or story. Kids can ask questions and learn how their experience connects to the Bible and God’s understanding of life. Our environment is structured so children’s passions and interests are reflected. This happens through creative arts, exploring nature, worship, dramatic expression, discussion, small group activities and bringing people in from our church community to share how God shows up in the ordinariness of their lives. Just as Jesus taught about His Kingdom through various mediums in life (gardening, the poor, the broken hearted, children, money, spiritual freedom, etc. ), we aim to teach our kids to see all aspects of life under the reign of God. From the simplicity of the life process of a plant, to the complexity of God being just, we walk with kids as they learn the story of God. We provide ways to help children experience Him as they creatively look at life and how God reigns over it. So rather than teacher led craft activities we believe children can express their learning better through child initiated art that allows for creative thought. We believe that children can handle deep truth at a young age (Matt. 19:13-14, 18:1-9, Luke 10:21, Prov. 22:6). Therefore, we provide curriculum that aims to provide children with a foundation of who Christ is, how He works in their lives, and how they should respond to Him. Teachers and leaders plan activities for children to express what they are learning creatively, and all classes have take-home materials to encourage and equip parents to interact with their children over Scripture and the lesson content during the week. We believe that children learn ‘precept upon precept’. Truth presented on a simple level in the preschool years is reinforced and expanded in the elementary years, and so forth. For this reason, truths are reintroduced to children as they grow older, each time digging deeper and widening the scope of their understanding. We also understand that each child learns differently and has unique needs specific to their personality, anxiety, special need or disability. Our heart is to integrate all children into the life of the church and into our ministry to children. Teachers are trained to interact with all kinds of children and we have leaders specifically gifted to work with children with challenges. We commit to working with parents on how to integrate their child successfully into our community. We aim to recognize the gifts and passions of each child that can be used for the good of the body and for the enhancement of their faith. Participating in Sunday services, being part of a home community, serving in a ministry, church events, being baptized, and partaking of communion are some of the various ways children are involved in the life of the church. There will be at least two adults in any children’s area regardless of how few children there are. • There will be no more than a 1:10 ratio in the Elementary ministry. • There will be no more than a 1:7 ratio in the Preschool room. • There will be no more than a 1:5 ratio in the 2’s room. • There will be no more than a 1:4 ratio in the One’s room. • There will be no more than a 1:3 ratio in the Nursery. • Never find themselves alone with a child. • Never touch a child in a questionable way during discipline or any other time. • Never use questionable language. • Get prior approval before showing a video tape. • Bathroom assistance: Only female volunteers are allowed to assist a child. Must leave bathroom doors open at all times while they are assisting children in the restroom. • Be sure they can always be seen by another adult. • Immediately report to the pastor or Children’s Ministry leader any behavior that appears inappropriate. It is important to set some boundaries with the children so that they are safe, have fun, & don’t hurt themselves or others while in our care. Teachers are given many suggestions & policies so they know how to interact with your child. But overall please know that we do not allow volunteers to yell, grab, slap, or spank kids. If you are new or visiting Imago Dei, please arrive 20 minutes early to allow time to park and check in. Eastside Gathering: Follow the signs to enter up the ramp and take the staircase down to the lower sanctuary. Central City: Make your way to the Ankeny building if your child is Elementary or Preschool age. If your child is 0-1, follow the signs to the infants area in the lower sanctuary. When you check in at the visitor/registration area, we will provide you and your child with security badges and ensure that your child is logged into the correct class. Volunteers will assist you in getting checked in, show you where your child’s classroom is, and introduce you to the classroom leader. Upon checking in to Imago Dei Kids, every family will receive one alpha-numeric pager. Occasionally, we might need to page a parent during the service (crying baby, injury, etc.). Please be alert to your pager if it goes off. If you are paged during the service, your pager will indicate which child needs your attention, so you can proceed to the appropriate area. Minor injuries: Typically, these are injuries that can be treated with loving attention, a cool cloth or ice pack & a Band-Aid. These are the only items we are allowed to dispense. Regardless of the type of injury or accident, instructors will notify the area director every time they fill out an Incident Report. This will help us determine the seriousness of the injury & communicate best with your family. • All toys are disinfected after each use. • Each caregiver wears a protective apron. • Hands are washed, & changing pads are disinfected after each changing. • Kids wash hands upon arrival to class. • All toys & tables are disinfected after each use. • Hands are washed after toilet use & sinks are disinfected regularly. • Children wash hands after bathroom use, sneezing or coughing. To ensure good health of everyone, children with colds, colored runny noses, fevers, rashes, or other symptoms of illness are not permitted into the imago dei kids. Exceptions are made for teething babies & children with allergies. • All children will be evacuated to the nearest exit & instructors will have them meet at the designated emergency area (the Preschoolers will meet in the law office parking lot across the street on Ankeny, Elementary will meet in the back Ash St. parking lot). • When the emergency is over, parents can securely pick up their children through the check out process at the designated emergency meeting areas. • First Aid kits & Imago Dei security will be with children in the event of an emergency. All children will be cared for until an authorized parent arrives to claim them.